snap it. map it. sell it. The first entirely mobile, location-based application for buying and selling anything. 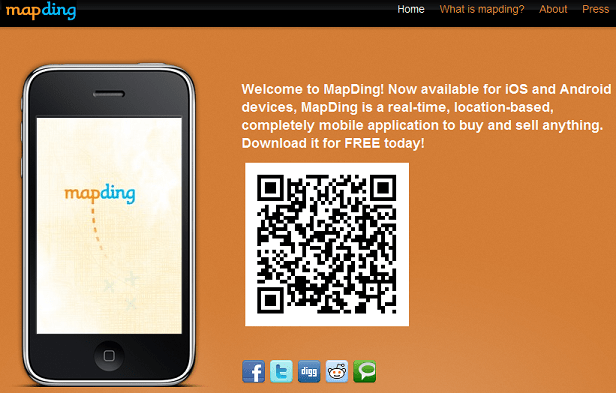 MapDing is a real-time, location-based smartphone application for buying and selling locally. MapDing uses GPS technology to geo-tag posted items by location and keywords. Buyers can search for items on a map browser or use custom keyword filters that automatically alert them if that item is posted nearby. Sellers can use keyword filters to find out when people nearby are searching for what they want to sell, and can post products when buyers are interested. Once an item is posted and a geo-match has been made, users then have the option to contact each other using in-app messaging to avoid spam and other privacy concerns. Sellers can search for statistical data such as demand of a product by zip code, average price point and competition. All users can share postings with friends on Facebook and Twitter. MapDing also allows local businesses to post products and instantly reach nearby customers, and will soon give buyers and sellers the option to make transactions in the application. MapDing is available for free in the iTunes store and Android Marketplace. Feedback would be greatly appreciated. Anything from the UX, design, web type or ideas.